Every carpet designed and woven by Ulster Carpet Mills is tangible proof of the values we hold to be important in our business - values which have become a way of life within the company. This powerful blend of people skills, technical capabilities and creativity has helped to make Ulster Carpets a significant force in the international carpet market.Design studios are located in Las Vegas, Los Angeles, New York, Dallas, Atlanta, Portadown, Kidderminster, London, Sydney and Melbourne. Total Flooring supply and fit an extensive range of bespoke carpets for all requirements. Whether you seek a contemporary, classic, or a minimalist finish, we will be able to advise you on making the right choice for your room. Choose between patterned, plain, textured or a something different and unusual. Total Flooring also boast the only NICF Carpet Master Fitter in Northumberland. 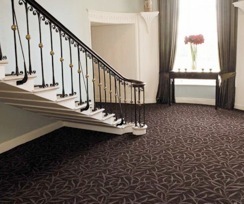 Brockway has been designing and producing premium quality carpets in Kidderminster since 1964. Carpets are in our blood: the business is family-run with a skilled and experienced workforce who combine real craftsmanship with the latest environmentally-aware technology and the finest raw materials to create innovative, beautiful and desirable floor coverings. All Brockway carpets are at least 80% pure new wool, which gives a luxurious, high quality product that's at home in any room. Our extensive range includes tufted and loop carpets, with a wide choice of stunning colours and textures. We're committed to sustainable production and choose our raw materials with care: our Lakeland Herdwick and Shetland ranges, for example, play a part in helping sustain traditional farming communities and a unique way of life in some of the UK's farthest-flung regions. View examples of Carpet flooring that we have supplied and fitted.